The last couple days, I’ve shown the beautiful goldwork & pearl and beadwork frames embroidered by Larissa Borodich. Well, for the fun of it, today, let’s look at the artwork she framed. Yep, I thought they were paintings or prints. Didn’t you? And surrounded by the sumptuous embroidered matting, I didn’t look that closely at the images themselves. Did you? 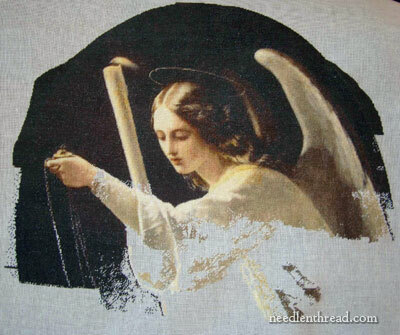 This is the first angel that goes with this beadwork embroidered mat. Remember yesterday when I mentioned that Larissa started out with counted cross stitch? Well, these pieces are worked entirely in tent stitch! She worked the designs on 25 count linen, with two strands of floss, over one thread of fabric. I really had no idea. My eyes were focusing on the mats, and though I admired the pictures they framed, I didn’t realize at first that they were also stitched! All I can figure is that Larissa must have the patience of the angels she stitched! Larissa acquired the patterns for these pieces through Golden Kite Advanced X-Stitch, which is a company that converts works of art, photographs, and so forth into charts for counted work. 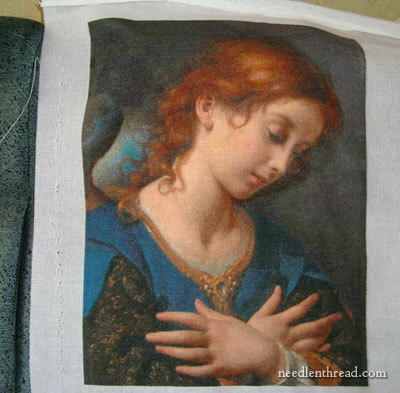 They recommend (and their kits come with) 18 ct. aida cloth for the stitching, but Larissa opted for a 25 ct. linen, and tent stitch instead of cross stitch. Thanks again, Larissa (& Anna of Talliaferro)! 1. The new Ask & Share section to Needle ‘n Thread should be up towards the beginning of this coming week! So look for that! 2. Today, I’m working on design for an ecclesiastical project, and I’ve been collecting the “ingredients” for that. I’ll begin working on it a week from Monday, but right now, I’m still in the design / collection stage. I’ll show you some of that! 3. Today, I must start a project, too! I don’t know what project, but it’s a project none-the-less, as I absolutely must get some stitchery into my hands. Since this is an in-between-while-waiting project, I’m thinking another quick monogram might be a good idea, or something to that effect. 4. I also want to get a “stitch-along” going, to feature on the “Ask & Share” section when it gets up and running. I’m thinking the Royal Persian Blossom design (for me, not the whole thing, but just a small element). Anyone else stitching any of those designs? 5. Goldwork has been beckoning me for about 6 months now. While the above-mentioned ecclesiastical project will help answer the call, I’ve also been dabbling with a series of small goldwork patterns that are kind of interesting. They won’t develop into something complete for a while, but daydreaming about them – and jotting notes, and working on design, and playing with supplies – is all kind of fun! I’ll share that with you in days to come. 6. And in here somewhere, believe it or not, I’m still filming embroidery stitches! So stick with me over the next few weeks, as the summer vacation really starts to pay off! Well, all I have to say is that this woman puts me to shame in the tenacity department. I’m wondering just how many of us “WeHaveOurHandsInTooManyPots” types are out there? I should be president of that club. You’ll remember I emailed you Mary about that gorgeous blanket in Inspirations Magazine? I drooled over the pattern. Slobbered while in the fabric departments pondering what I would put it on (no I didn’t get any slobber on any fabric) but drool I did! Well, my cousin visited me last night and I showed her my lovely thread cabinet that my husband bought me at an antique store. She looked at all of my threads I have so lovingly put away. I told her all about the blanket in the magazine and she looked me square in the eye and said…what about that quilt project you were making? Uhhhhh, oh…ahem…ah..yes…that project I stammered. Uhhh,, tee hee,, I guess I should do that one first since I’ve already started it. (inset a very red face here). We’re going away on a girls weekend this coming Friday. I’ll be taking that quilt block embroidery project with me and do the “15 minute stitching” while we’re away. I’m finally going to finish one project before I move on to another. (well….I have every intention of doing so at the moment I write this comment anyway). Only time will tell. (and maybe my cousin might rat me out)…. Wow, these are absolutely beautiful! I had no idea that was stitched either, but had been wondering. If you do go ahead with the stitch-along, I’d love to do it with you. Let me know which pattern you want to do, and I’ll go ahead and order and get ready. Ah, listmaking. I’m going back and forth between things as well. Right now, I am working on the Agecroft Sweet bag, which is almost done. I’m not using the kit though – I’m using fine wool instead. I’m working on a reproduction civil war battleflag for my father-in-law. And I’m working on a design for goldwork, which hopefully will be done soon and ready to be stitched. Oh! And I signed up for the Goldwork Master Class at Thistle Threads, which starts in August. I’m glad I waited to take it – I think I’m at a point where I’m ready for the more advanced stuff. Your post the other day about priorities and saving up for what you really want to do actually was my inspiration for signing up for the class! Well! I’ll be! That is most amazing. She must be an angel indeed and with great eyes to do all that. 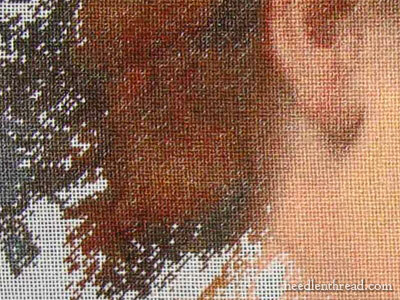 What extraordinary patience and diligence to work on large pieces with such small stitches that look like paint on canvas. Her idea of using the linen is also good. 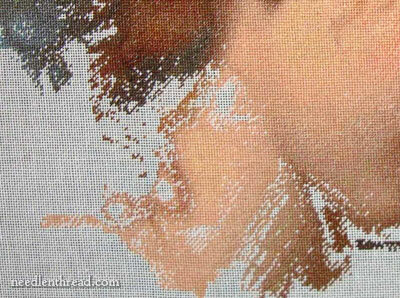 The look would be quite different on Aida cloth with cross stitch. Thank you and Larissa for sharing this with us showing us what great things can be accomplished with needle and thread. Thank you also for all your plans for the near future. We, your readers, are certainly the very fortunate recipients of a lot of knowledge and instruction, and of beautiful things to delight the eyes and soul. OH MY!!!!! … Thank you so much for sharing these beautiful treasures! They absolutely took my breath away! This teaches me again never to assume anything. Since I’m familiar with the beautiful painted icons and was in awe of the lovely images … I completely got lost in admiring the frames. They are such work of art! The needlework is stunning … I’m speechless. How lovely, talk about patience, I love the beading on the frame and the beautiful stitching thank you Larissa for sharing such beautiful art with us. Mary I can’t wait for the stitch along on the new ask and share feature. I am very enamored with this stitching. A work of art indeed and such an inspiration, honestly makes me want to try. My fingers are not nimble like a woman and that is a fact. G’day Mary, funny thing, is mostly G’nite here when i’m writing this! Anyway, hullo! The mind boggles at these magnificent works of art, masterpieces, this lady has achieved. I did notice the art works. They seemed different, and I vaguely wondered what they were ‘done’ on, but I didn’t think past that except to admire them. Never thought for a moment of needlework. And, when our attention was on the exquisit beadwork it was enough to distract, but not detract though, from the pictures. Both elements are married together extremely well. They’re “like two halves of the one soul”. It’s all just so beautiful. PS, your agenda for us (I think you come in there somewhere too!) is tantalising. Looking foreward to it. Will brighten my winter days considerably. Cheers, Kath. I am in awe of here work. It is so amazing. Could look at it all day long. I would stitch along on the Royal Persian Blossom! That would be fun! Larissa’s work is gorgeous and she is amazingly patient and talented. I am looking forward to the new stuff that you have planned. THUNK!!! Yes, that was my jaw hitting the table AGAIN! I was so focused on the mats, I really didn’t look that closely at the pictures themselves. Larissa – I was in awe of your work already, now I’m…..words escape me. I’m looking forward to the new projects and other items from you, Mary. Larrisa’s work is extraordinary indeed. She has gone far, far into the “I could only dream about doing this” world. The meticulous work and inspired designs are just so beautiful. I am wondering if she keeps these incredible treasures, or if they are given away? As to the Royal Persian Blossom, I too have already acquired the kit. I have foot surgery scheduled for July, and will spend several weeks with no walking. The kit is my consolation prize and I am excited about working on it. A stitch along would just be fabulous. Thank you so much for showing us Larissa’s work! Truly Amazing! I have great admiration for Larissa. Oddly enough, I have just ordered the Royal Persian Blossom, so I’ll be ready to stitch along!! Hurray! The pictures are as striking and delightful as the beaded frame. I was thinking “Scarlet Quince” when I first saw them. It is very lovely art. Thank you for sharing Larissa and Mary. I actually did wonder if they were stitched as they were what caught my eye long before the “mat” and then I realized the mat was what you were referring to and didn’t even enlarge them. I thought they were probably too detailed and had to be painted for that kind of blending. Just recently found your website and love it. There are 4 websites that deal with these kind of designs. I use Heavenandearthdesigns.com but there is Mystic Stitch, Scarlet Quince and Golden Kite. I use 28 ct fabric for mine. Check out heaven and earth. They work with all kinds of artists. Hello, Mary. this artwork is absolutely amazing!! I never thought of that. I was looking so much at the frames and beaded embroidery. I thought they were beautiful pictures she had made frames for.Your site always pays off. Next Next post: Embroidery Design Process: Haphazard at Best?